2) Prevent people from throwing dogs away that they don't want anymore. One often hears stories of people that adopt a puppy, then get bored with it and leave the dog on the street after it grows up. Well, you can't do that anymore if the dog has a chip. The province is spending $350 000 this year on a plan to put microchips in some 60,000 dogs. It will also be spending $2.6 million on the construction of an animal shelter this year in Hwaseong (another city in the province) for strays, and this one should include all animals, not just dogs. Cities until now: Suwon, Seongnam, Anyang, Bucheon, Goyang, Uijeongbu, Namyangju. 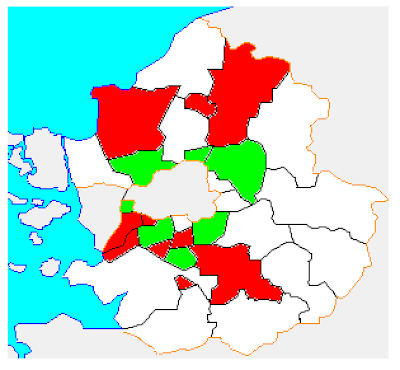 New cities: Ansan, Shiheung, Gunpo (lived here a year BTW, great place), Uiwang, Paju, Yongin, Gwangmyeong, Osan, Pocheon, Dongducheon.This map shows the location of the cities with the original cities in green and the new adherents in red. Seoul is right in the centre. The article doesn't contain any information on cats but anything to increase the responsibility of pet owners will have a small reciprocal effect on them too.